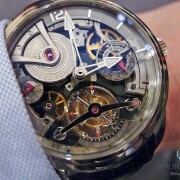 Since visiting the Bovet manufacture in Fleurier last year, I’ve developed a newfound love for the brand. And, yet, if you had asked me which one timepiece stood out and made me fall head over heels, I would have had a hard time giving you an immediate, concrete answer. 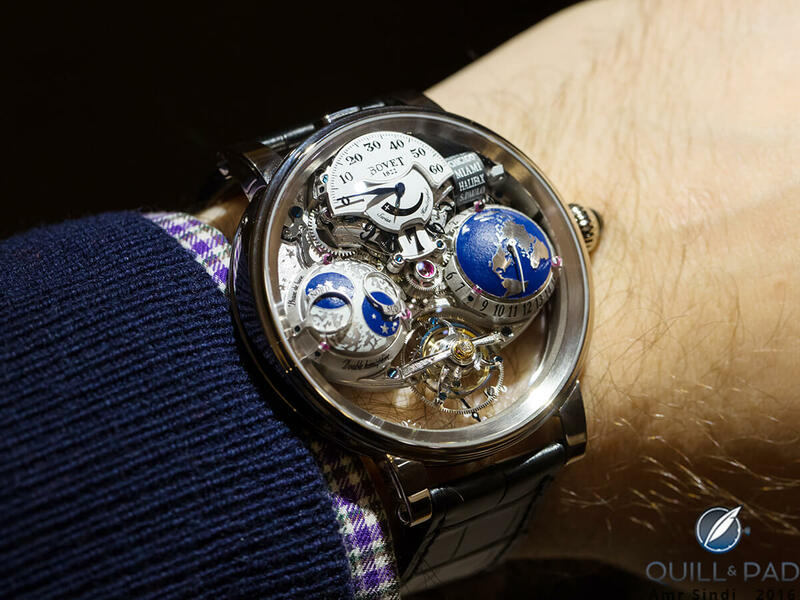 That is, until January 2016 when I discovered the Bovet Récital 18 Shooting Star. Let me start from the outside and work my way in. One of Bovet’s most distinguishing features has been the Amadeo case, which includes a patented reversible system allowing for two dials and displays in a single watch. While beautiful to admire and quite original with its double display possibilities, I always found the Amadeo line a tad too lavish for my taste. The Récital 18 on the other hand belongs to the Dimier line, whose case comprises a more contemporary round shape with a traditionally positioned crown − the Amadeo collection’s ornate crowns are at 12 o’clock − though one that is no less regal with its attractive cabochon. Because most of the movement and indications are in the upper half, the case is inclined towards the wearer’s wrist, enhancing the sense of depth and allowing a front-on view of the movement through the pronounced domed sapphire crystal. The Récital 18 features a jumping hour display just above the center of the exposed movement, consisting of a transparent glass disk with black numerals over a white lacquered plate highlighting the current hour. A semi-circular retrograde minute display is positioned at 12 o’clock, with a power reserve indicator below. I would have liked for the hours to be more prominent and the power reserve indicator less so, but that’s purely subjective. What I do appreciate is the domed dial and how the hands follow the contours. Interestingly, the seconds are displayed counterclockwise on the case back side of the movement, on the same axis as the tourbillon. The minutes can be set using the crown at 3 o’clock (which is actually more than just a crown, but I’ll get to that) while the hours can be advanced using the dedicated pusher between the lugs at 12 o’clock. This is a rather practical feature for when you’re traveling between different time zones. 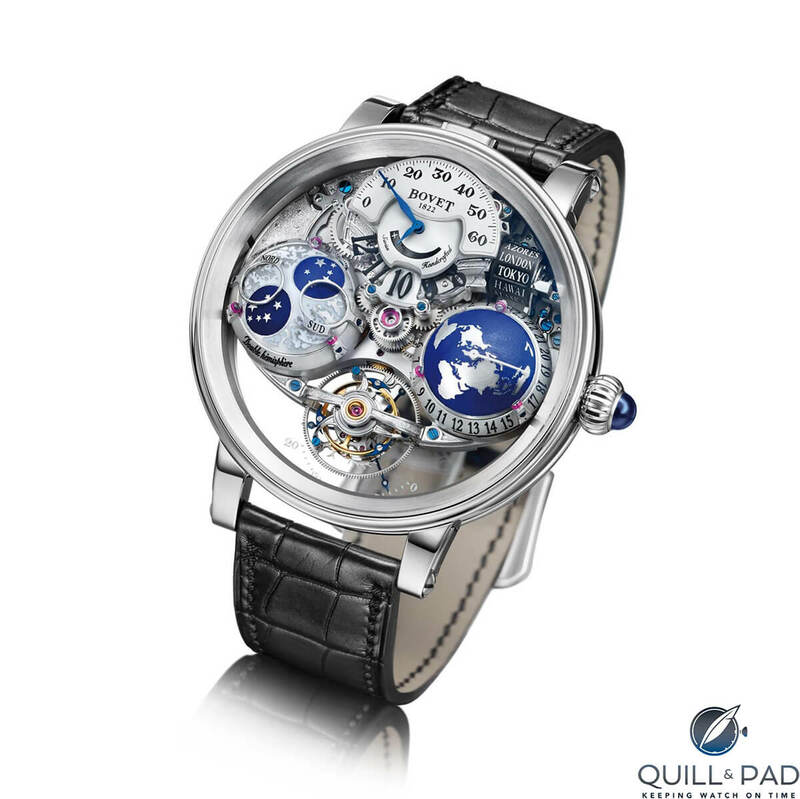 Now let’s move on to the first of the two dramatically executed complications, the world time indication. Using a three-dimensional depiction of the earth that represents the entire globe (a cartographer was commissioned to develop this), a curved hand fixed to the North Pole indicates the current hour on a concentric ring for one of the 24 time zones selected by the user. The name of the city appears on one of two concentric rollers, though you might not even notice that there are two of them. An elegant and space-saving solution, the outer roller displays 11 cities, while an opening reveals the remaining 13 cities on the inner roller. One of the most technically impressive little tidbits related to the world time function is one you can’t see, but you can feel it when you handle the watch. To make jumping between the 24 time zones as effortless as possible, the corrector is integrated directly into the crown, meaning you just have to push it once to jump to the next time zone on the rollers. The really clever part, however, is the patented “constant force” correction mechanism within, which requires a certain, fixed amount of pressure to advance the indications by means of a spring. This means that any other pressure applied (accidentally or otherwise) to the crown is nullified and doesn’t affect the movement as it would with a traditional pusher or corrector setup. Another noteworthy feature is the jeweled, low-friction rollers for the two hemispheres, ensuring that they advance as smoothly as possible while minimizing friction to the mechanisms involved. And, frankly, they just look awesome. The next hemispherical complication is the moon phase, which depicts the age of the moon in both the northern and southern hemispheres. The hand-engraved moon even shows the cracks and craters on our satellite’s irregular surface. One of my favorite details is an almost childish one, though I don’t think I’ve seen a photo of it anywhere else: the oceans of the earth depiction and the recessed parts of the moon are painted with Super-LumiNova. Admittedly, the effect of a three-dimensional, photo-luminescent component gets my heart beating a little faster every time I think of it. The rest of the exposed movement is decorated with a starry sky motif, involving hand-engraving and grained surfaces. The Récital 18 just oozes superlative handmade detailing, and coupled with Bovet’s voluminous movement and romantic approach to expressing time, it’s hard not to appreciate the coherence of decoration across the entire watch. If you’re looking for something inconspicuous, a Bovet probably isn’t for you. But if you appreciate the brand’s overtly poetic styling and whimsically executed complications, then the Récital 18 is one of the most elaborate GMT/world time watches around. For me personally, it’s easily in my top 5 watches of 2016 thus far and easily my favorite Bovet to date. For more information, please visit www.bovet.com/recital-18-shooting-star. You will find the pricing at the end of the article. Enjoy! This really is quite sublime. It has stopped being a watch and has become art. Thank you for taking the time to comment on these aspects of our shared passion. 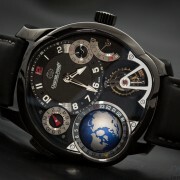 Greubel Forsey Celebrates 10th Anniversary And I Reminisce Back When . . .